What does “Work/Life balance” mean to you? You know when you are not in balance. You sense when your most important needs and values are starved, and you crave the opportunity to meet those needs, and express those values. The overworked entrepreneur dreams of a few days off by the beach. The working parent secretly prays for a snow day and the chance to be with their kids with no errands to run, and no agenda to fulfill. The desk-bound worker fantasizes about hiking a trail in the woods, drinking in fresh air and the beauty of nature. Adult life seems to bring ever-increasing roles and responsibilities. Look at this list. How many apply to you? And then there’s that other role: the role of being you. You are, after all, a human being with your own needs and wants. A person who needs sleep, exercise, recreation, love and fun. (remember that ‘you’?) And each of these roles, however precious and desired by you, demands your energy and time. It’s not that you don’t want to have these roles (because you do!). But one day you wake up and there simply aren’t enough hours in the day. And so something has to give. What most people, responsible people, cut first, consciously or not, is energy and time given to their own needs. So what happens? You suffer. Sleep suffers. Stress mounts. Self-care goes out the window. But everyone else’s needs get met. You won’t let yourself ‘fail’ by letting others down. But you will let your own needs…your own body, mind and spirit…be sacrificed. Everyone else wins, but I lose. Being Intentional means doing things on purpose– wide awake and conscious of the benefits, and costs, of your choices. It’s aligning your choices with your values, and respecting your own needs. 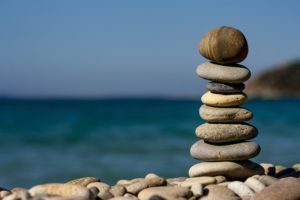 So the first rule in finding work-life balance is to be intentional in how you align your actions (how you spend your time) with your values and needs. And in order to re-establish things, you need to begin with YOU. By practicing intention, you are setting a plan of how you want your day (and life) to go. If you know that you have back-to-back meetings tomorrow, what might be important for you to do today or in the morning to prepare? With lack of intention, your day can take you for a ride, leaving you feeling out of control and overwhelmed. When this happens regularly, you might sprint through your week leaving you exhausted by the weekend. If you manage your day (and life) with intention, you will feel not only feel in control but you will ensure that you set yourself up for success by making time for what matters. What would your days and weeks look like if you practiced extreme self-care? How would that feel? How would that impact your life? What are your challenges in finding healthier balance? Once you identify what you want your days and week to look like, you can then identify how to integrate them in your schedule. By identifying challenges, you can identify strategies to overcome them and/or identify what needs to change to improve your schedule. This may be discussing options with your supervisor such as working from home one day a week or coming in an hour early in order to leave early. In some cases, it may also mean that you decide to look for other opportunities that afford you better work-life balance. When our work life is hectic, we spend a lot of our energy juggling, and keeping all those balls in the air. That may leave little energy when we get home to be intentional about our evenings. Think through the strategies you use at work but might not use at home. Weekly check-in meetings: Your team has weekly meetings to discuss the week’s priorities; why not do the same with your family? Not only will your family members appreciate that they are just as important, it will ensure that you plan fun things to do together! Scheduling using a calendar: You schedule meetings and tasks each day at work to keep track of your responsibilities, putting important events and reminders on a personal calendar can help you feel as efficient and productive at home as you do at work. Strategic planning: At work, strategic planning provides a sense of direction and guides decisions. Isn’t your personal and family life just as important? You will make the most of your time at home by being strategic on what you want to accomplish whether it be personal health goals or booking a vacation for your family to spend time together. Here are a few of our favorite resources that explore the concept of work-life balance and productivity. Rise Together, a podcast hosted by husband and wife team Dave and Rachel Hollis explores how to plan life out together as a couple in this podcast episode. Their advice: plan quarterly. Anticipate what the next few months hold. What do you want to do to ensure that you make the most of it? Headspace, a meditation app, has meditations focused on work and performance including prioritization, productivity, finding focus and (surprise!) balance. Our favorite feature – you can set daily messages (Mindful Moments) to keep you mindful throughout the day. Working with a coach can help you develop strategies to navigate the challenges of work-life balance. Check out our executive coaching services and sign up for a free consultation here.